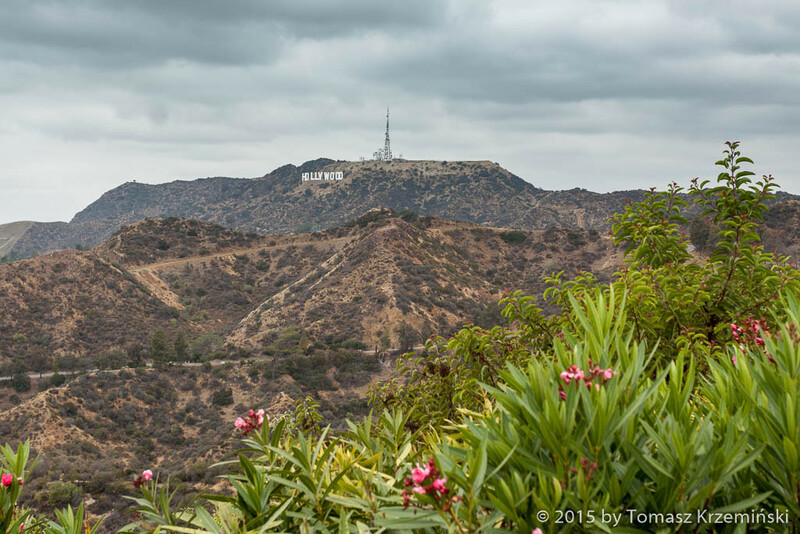 Hollywood is a world famous district of Los Angeles California. 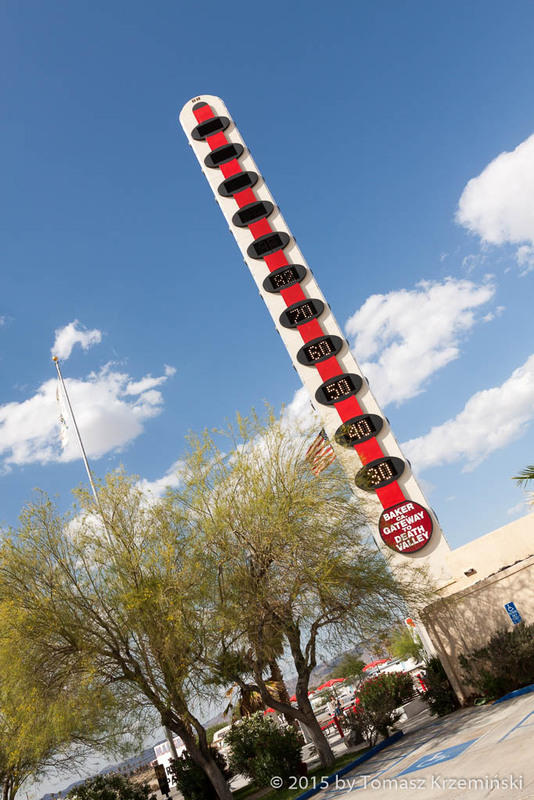 The sign on the hill is 45 feet (14 metres) high and 360 feet (110 metres) long. 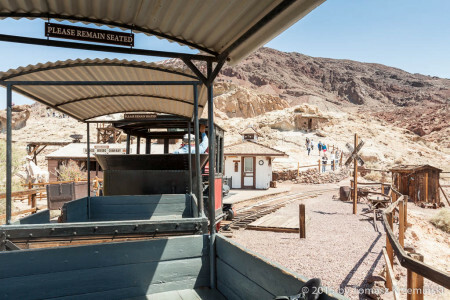 You can see it from a distance only, because direct access – by car and on foot – is forbidden. 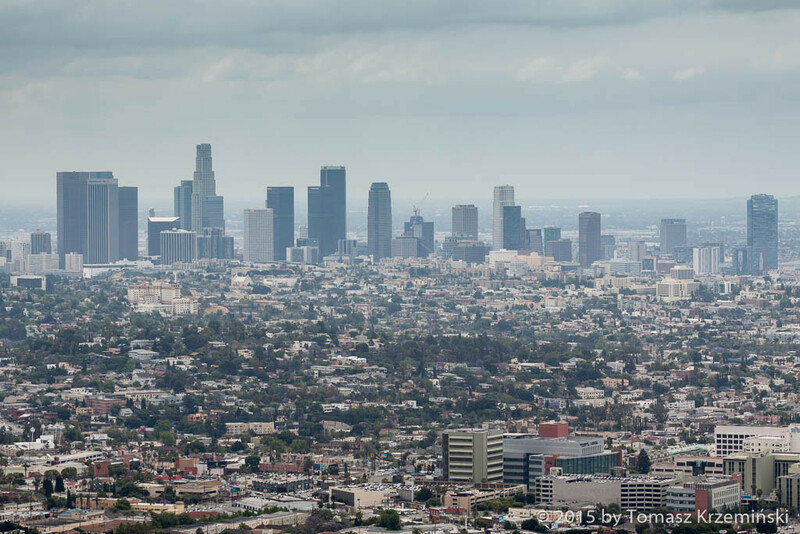 A view of the centre of Los Angeles, not always bathed in sunlight. 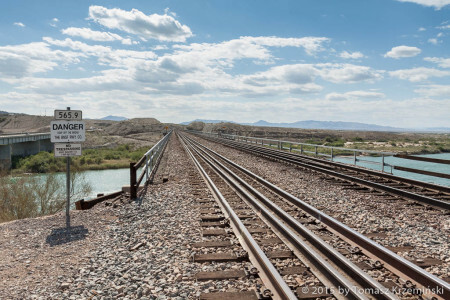 Once owned by Spain, then by Mexico, it stays Spanish language city. 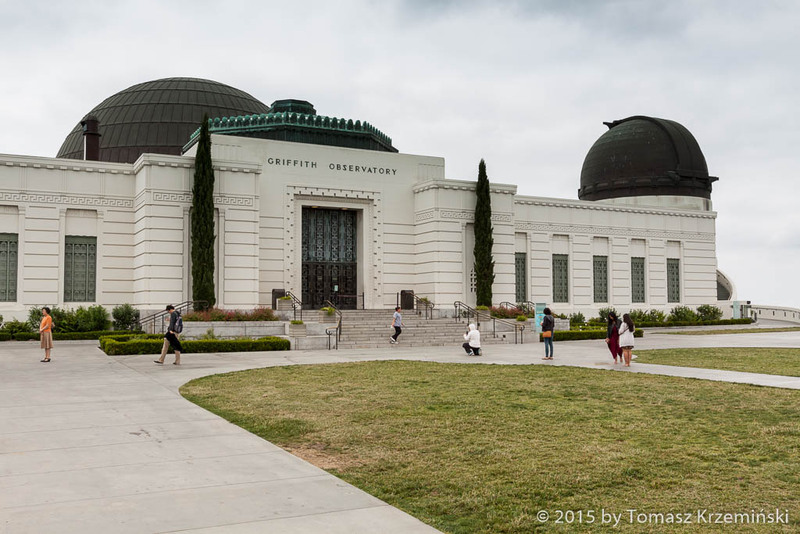 Griffith Observatory for lovers of astronomy and... the Terminator. 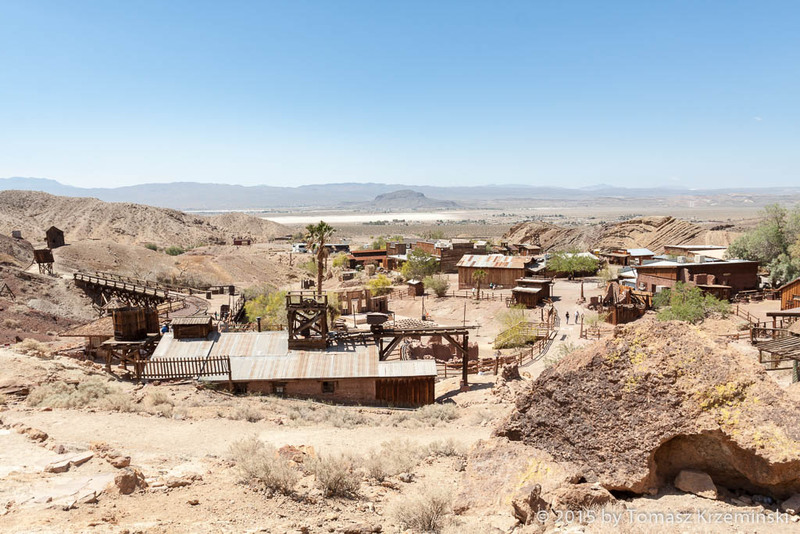 The scenes of the first part of this movie were shot right here. The director of the latest part “Terminator: Genisys” used it once more in 2015. Walt Disney Concert Hall at South Grand Avenue 111. 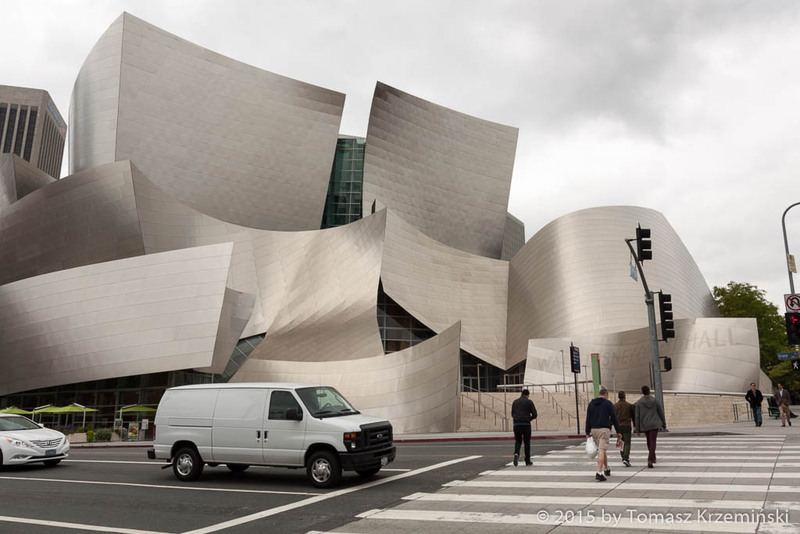 This amazing construction was designed by Frank Gehry, well known American architect of Polish-Jewish descent. He’s the one who designed the Dancing House in Prague, in Poland unfortunately he designed nothing so far. Hollywood Walk of Fame at Hollywood Boulevard and Vine Street commemorates a very important persons of showbusiness. There’s Dolby Theatre (known as a Kodak Theatre before) – where every year Oscars ceremony takes place, Chinese Theatre and Egyptian Theatre. 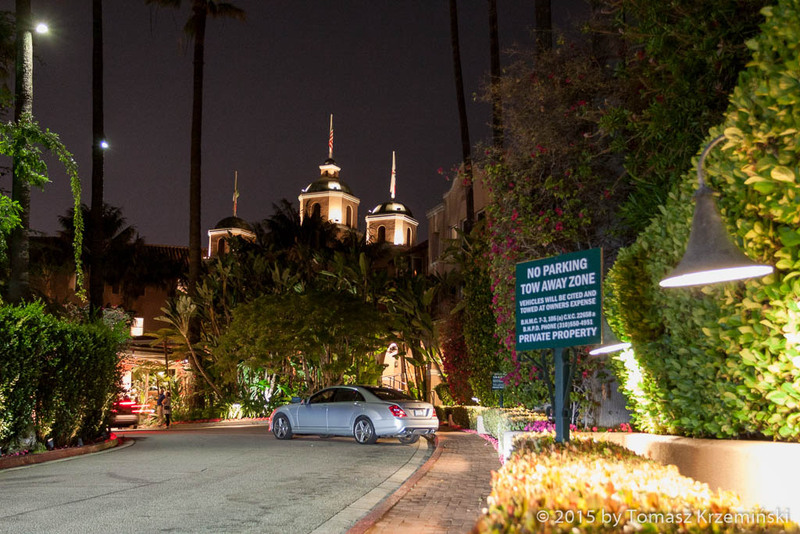 Beverly Hills Hotel at Sunset Boulevard. This is the hotel which appears on the cover of Eagles album “Hotel California” issued in 1976. To this day the title song stays on the top of the hit charts of all time. 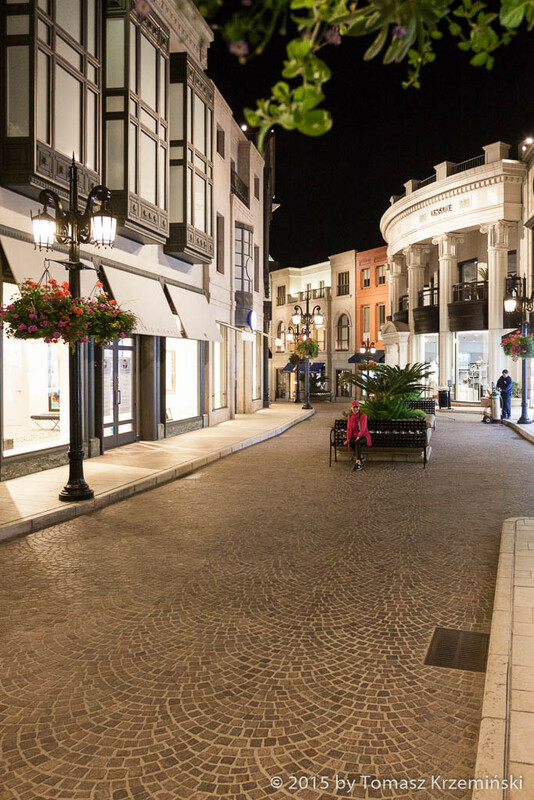 Two Rodeo is a street in a European style added to Rodeo Drive – the most expensive street in LA with luxury brands shops. 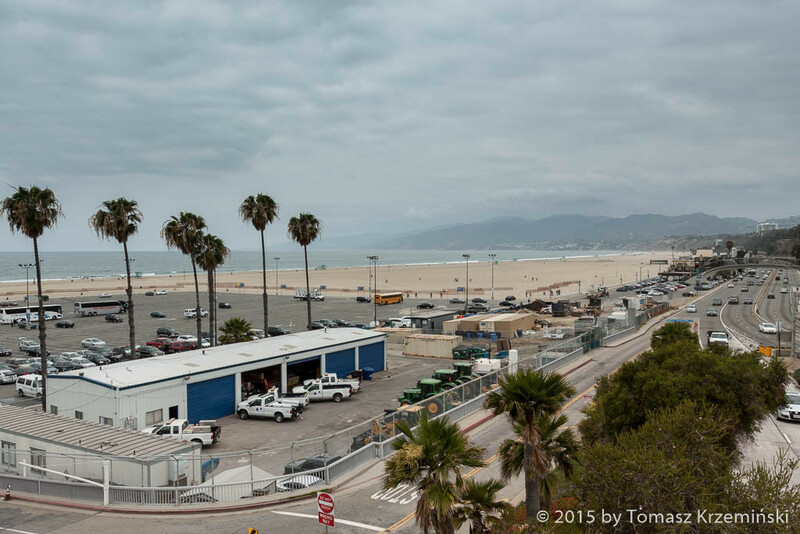 Santa Monica Pier at the Pacific Ocean in Los Angeles metropolis. A view of the beach from Palisades Park – a long promenade on a cliff just right for a walk before setting out on a long road. Right here at the End of the Trail sign starts our journey in opposite direction, which means from the very end of the West to the East – to Chicago. That’s 2448 miles (3939 km) of the road ahead of us. 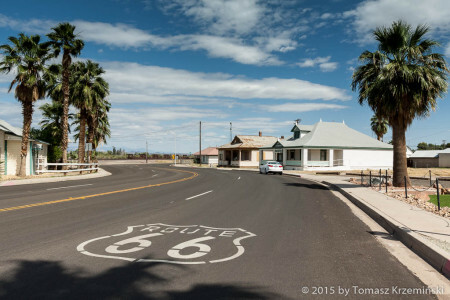 In fact Route 66 ends at a busy highway. 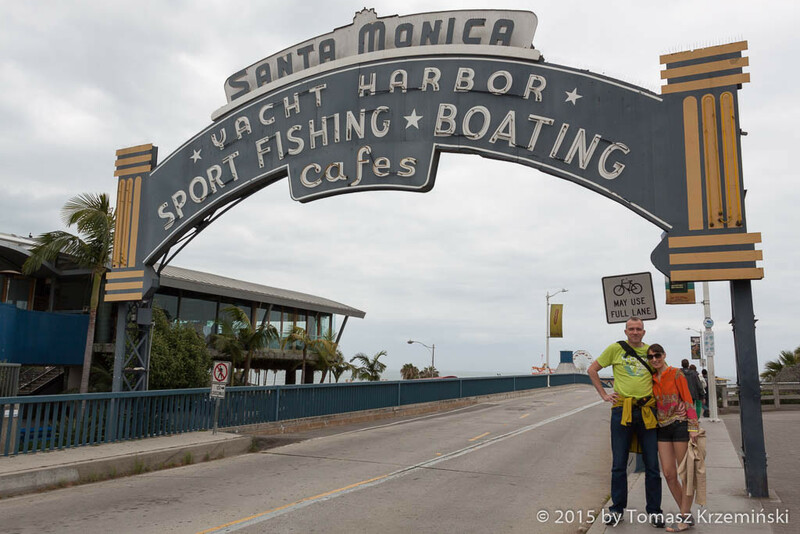 For safety reasons they moved its symbolic end to the 4th Street and Santa Monica Boulevard junction. The sign on the pier stands here since the time when you could drive onto a pier, and stays a cult place to this day. 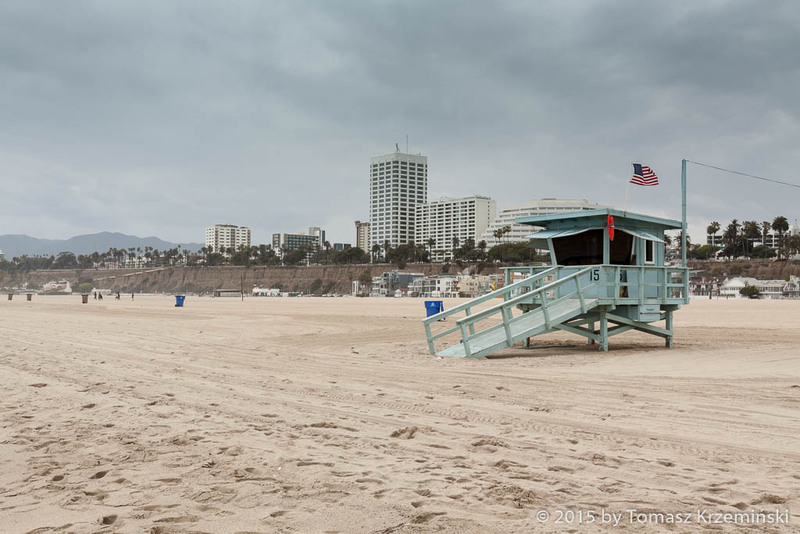 A wide beach, just like in “Baywatch” series. A memorial plaque at the end of the pier commemorates well known man, hippie and artist Robert Waldmire. 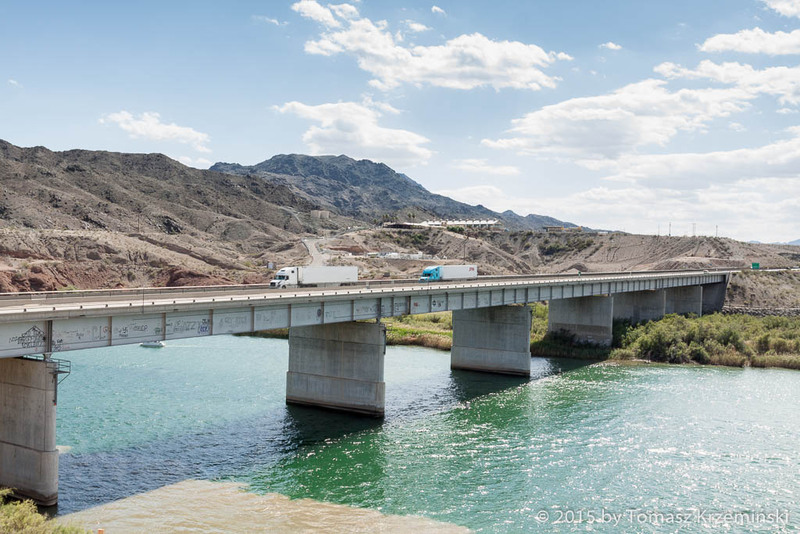 He spent his life in Volkswagen Bus, literally living on Route 66. 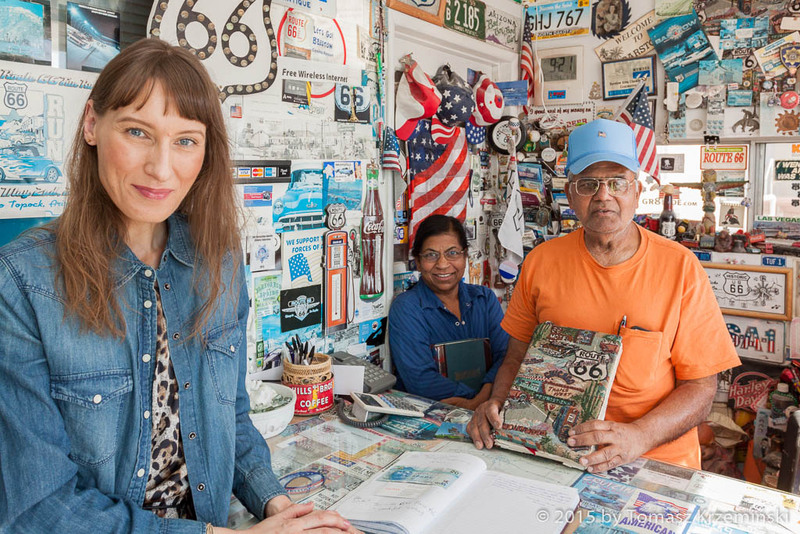 He draw maps of the Trail, postcards of known places of Route 66, posters, also signboards and murals in cities where the Road runs through. Additionally he often put witty slogans, sometimes a lot of information in small print on it. 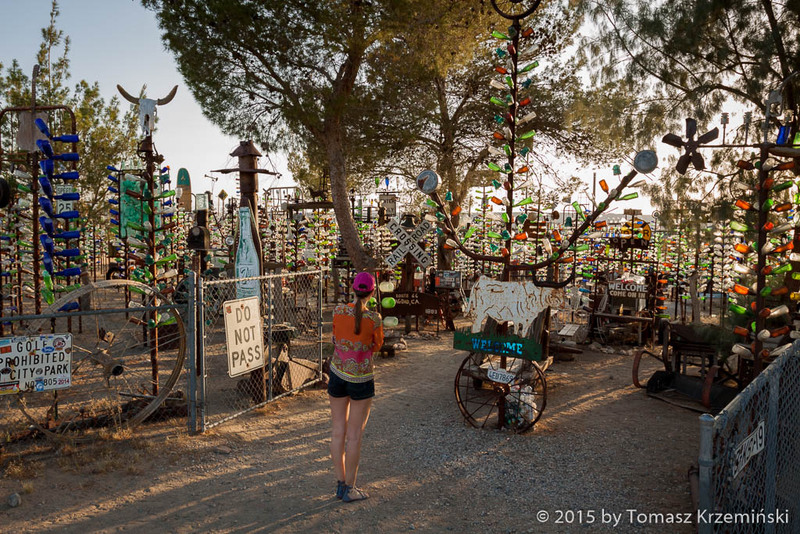 Pacifist, living without a cellular phone and no internet, loving his home – Route 66. 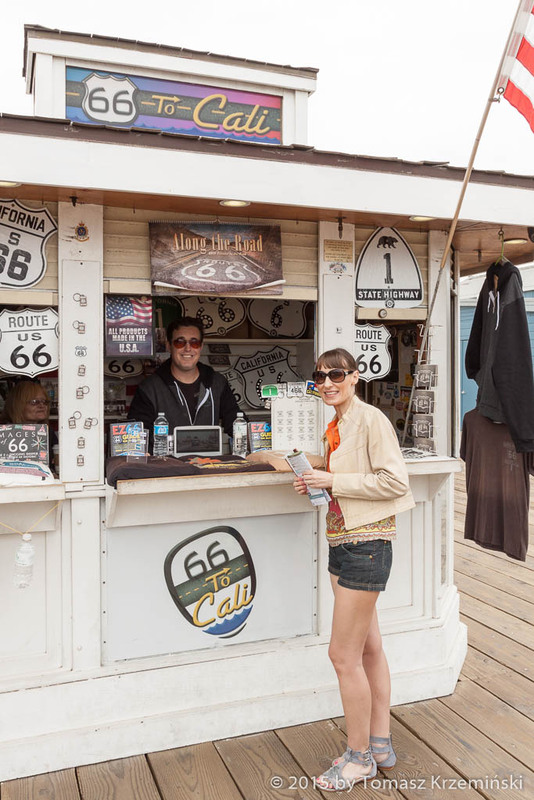 The first shop on Route 66 called “66 to Cali”. You can buy here t-shirts and boards – everything “Proudly Made in the USA”. Shawn, with a big smile on his face, spent with us an hour preparing us for the journey. Shawn! Thank you once more for preparing us so good to the road! 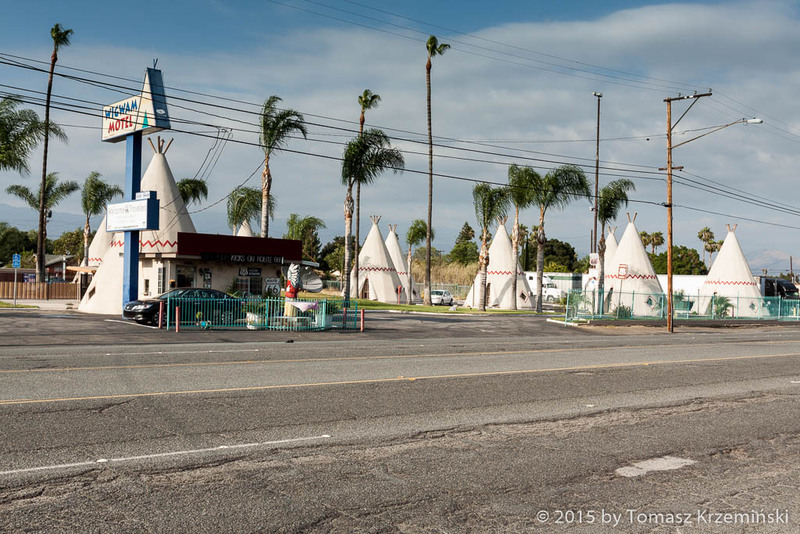 One out of two Wigwam Motel at Route 66 – here in San Bernardino CA. Each wigwam has one room with bathroom! Construction itself is made of concrete. 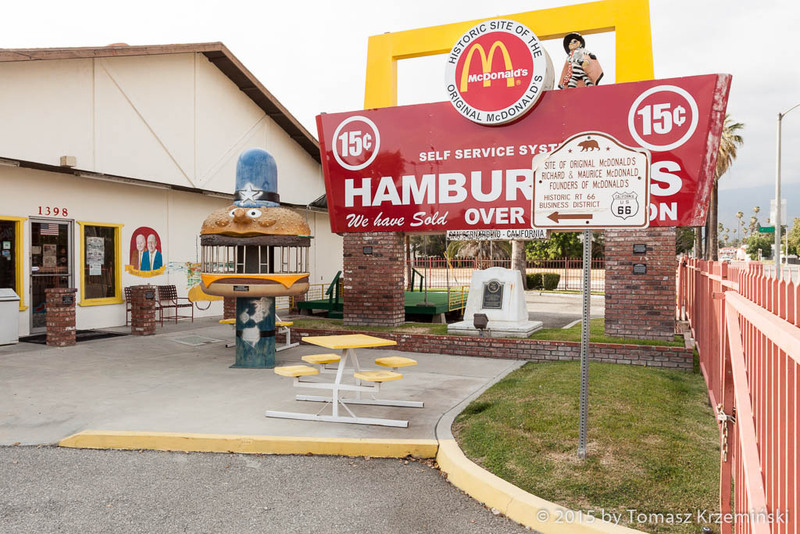 First in the world original McDonald’s was opened in San Bernardino in 1940. 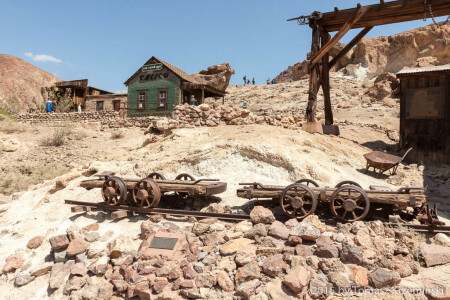 It’s a museum now. 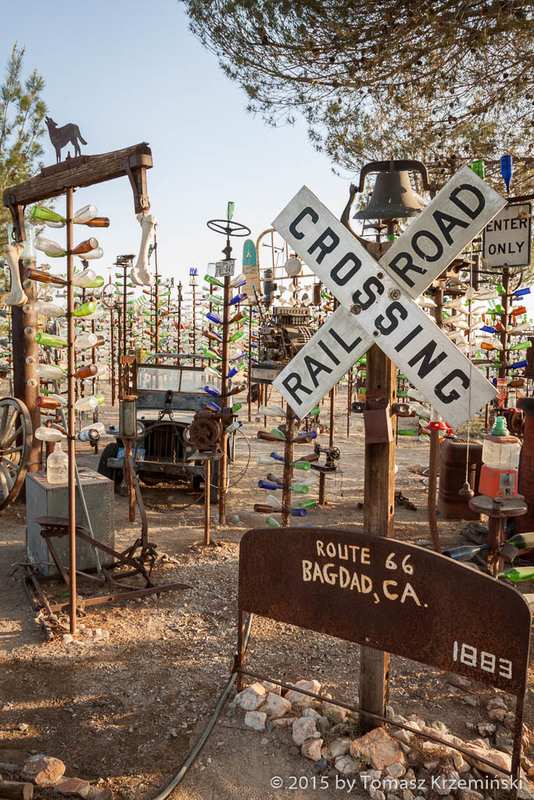 Elmer's Bottle Tree Ranch in the middle of nowhere in Oro Grande CA. It’s an amazing place, especially just before the sunset, when low falling sunrays reflect in this colorful glass. The wind stirs the metal parts, just like it was playing its own melodies. 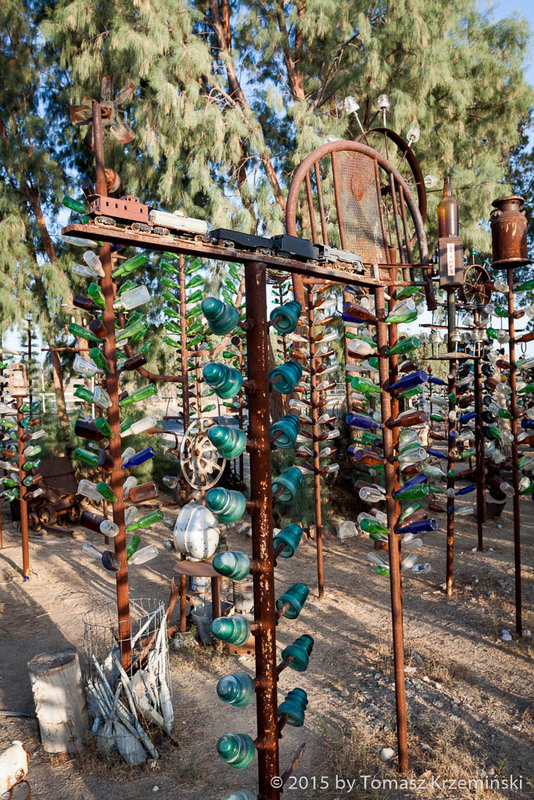 Little humming birds come running to the mini waterholes on the bottle trees. Once you experience it, you will never forget it. 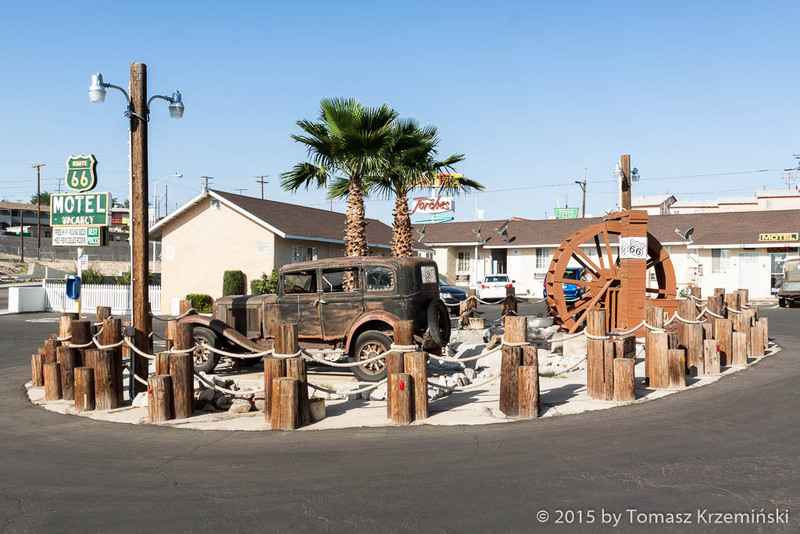 Route 66 Motel in Barstow CA – it’s a first night on the road for us. Ideal place for a real American lodging – rooms with round beds, and six and a half feet from a bed... next to the window we leave our car on the parking lot. A wonderful couple from India runs this motel for 35 years (they live in the USA for over 50 years). 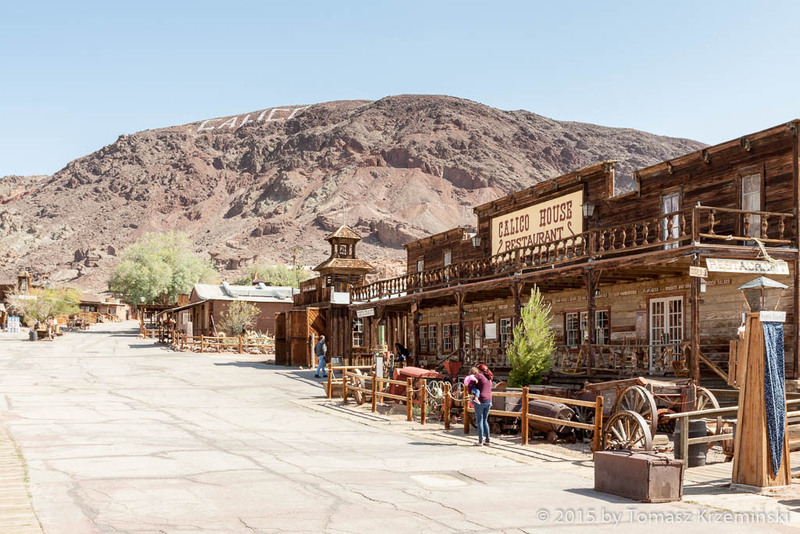 The motel was opened in 1860! 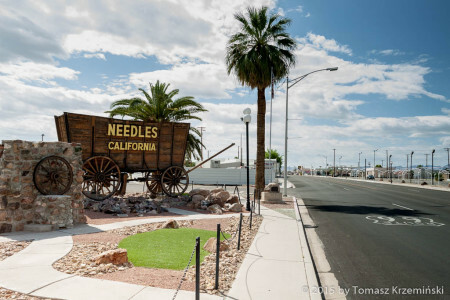 You can see here the old photos dating 1928, when the whole Barstow was only this motel and one property on the other side of the street. 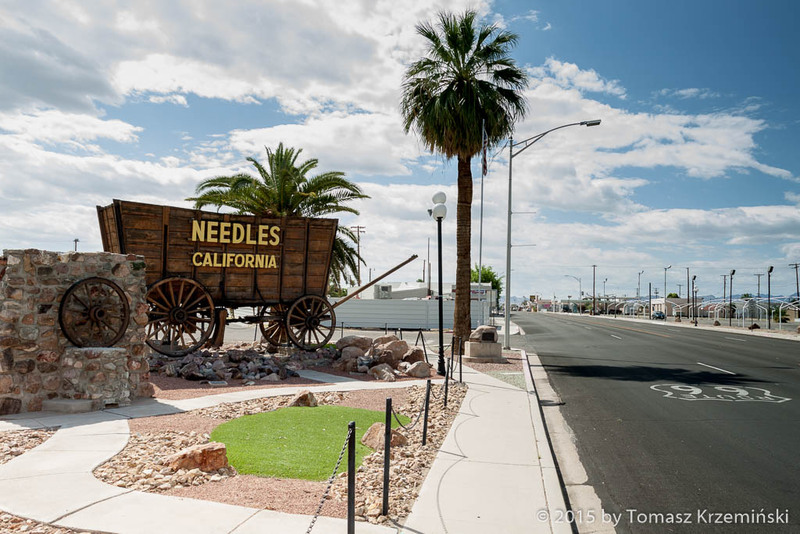 The owners of this motel are a mine of knowledge about Route 66. They shared with us very practical current information, including the journey “beyond the Trail” to Las Vegas and Grand Canyon. Ved and Mridu! We will never forget you, your advices for the trip and the night at your motel! 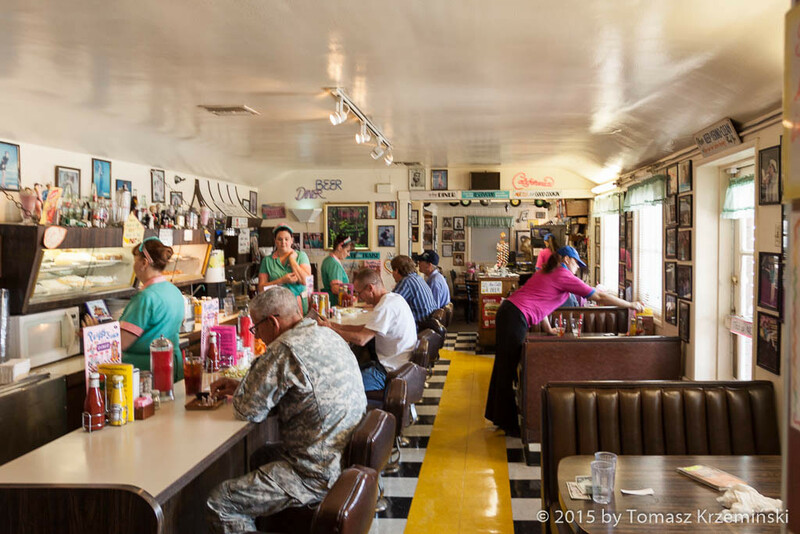 Peggy Sue’s 50’s Diner in Yermo looks like taken out of an American movie from the 50s. Booths, counter stools, candy colors. And smiling waitresses bustle around the tables, pouring another cup of coffee. You can eat here hamburgers, big meat sandwiches, and ice cream sundae for a dessert. After the dinner you can take a look on a photo’s collection on the walls with well-known Hollywood people (current owner has worked with movie stars for years). You can also buy beautiful souvenirs and toys in the shop next to the diner. 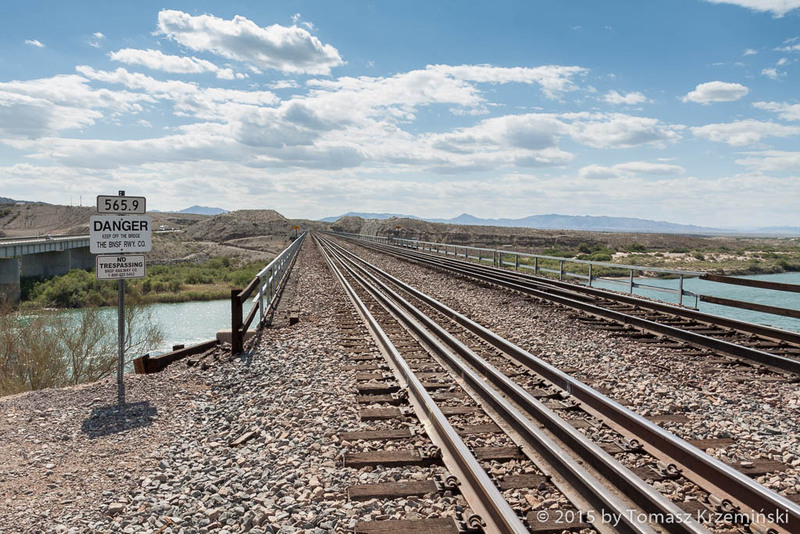 Baker is located at Interstate 15, that’s not at Route 66 which goes to the south of here. We couldn’t take Route 66 because, as Ved in Barstow told us, there where flooded bridges and the Road was not passable. 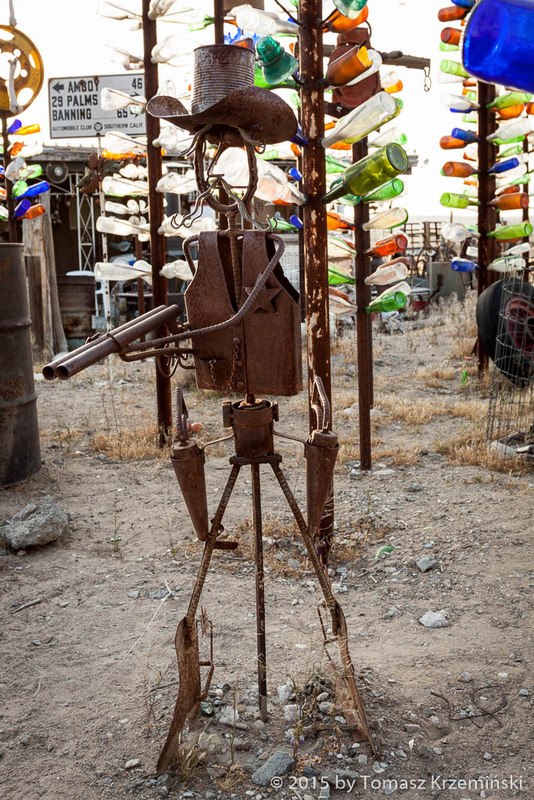 That’s what happens sometimes on Route 66. 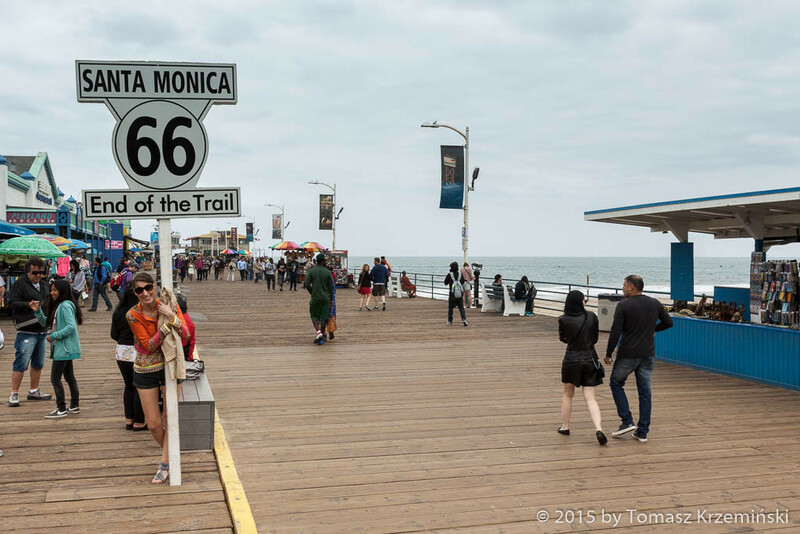 Length of Route 66 in California is ca. 314 miles (ca. 505 km).